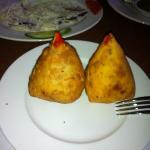 Description: Specialising in North and South Indian Tandoori Cusine. Very average rather bland for indian food. Busy with many Russian tourists. 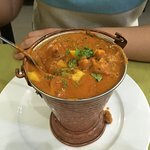 Food was tasty but the "Chicken Tikka Masala" advertised as a favourite British dish was the same as Ganish in "Mui Ne" and was NOT chicken Masala, it was not creamy as a Masala should be. 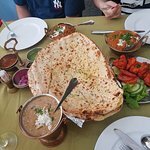 The sag aloo was fine and tasty. Service was ok and the price average. I ate here back in March 2018. Back in nha trang again for holidays and ate dinner here twice . The very affable manager whom I met and spoke to is no longer here . I enquired and was told he is busy opening another branch of Ganesh in Nha trang . 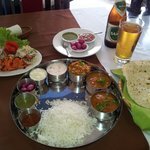 When I ate dinner on another night the chef told me he went back to India . I miss his warm personality and banter . The food was not as nice compared to last year but I ordered different dishes. 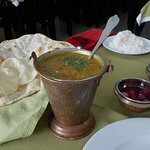 I found the Goaan fish curry rather bland . I ask for medium hot . Overall it is still good and I enjoyed the food. For the second dinner , I ordered my usual lamb vindaloo and tikka masala and this time I requested hotter than medium but less than hot and the dishes tasted much better . I have come to the conclusion that I will order hot next time . Hot translates more spicy rather than chilli hot . Will eat here again when I am in Nha Trang . Recommended. Spending only one evening in Nha Trang (Thank god, its just too many spoiled russians here) we where in the mood for some indian food. This was the best rated by far so our expectations where pretty high. At first we went upstairs to get some calm from the traffic stress etc. but the smell (from the toilets?) was leaking out into this floor and would make the meal unbearable. So we got a seat near the main entrance instead. 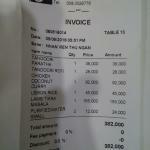 Well, we really had nothing to say about the quality of the food but rather more about the service and THE MUSIC. So, we thought the music (traditional indian music) was cool at first, only to find out that we would regret this later. Why? This ”song” just never stopped and continued on a 15 second loop over and over again turning the restaurant into a musical torture chamber..lol! And the service.. We really didn’t got much of a welcome or a thank you/goodbye. They all seemed a bit stressed even though there weren’t a lot of guests there. 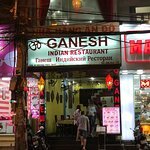 After frequenting Ganesh in Hoi An we thought we would sample other Indian Restaurants in Nha Trang. Following somehow disappointing results we returned to Ganesh hoping it was as good as Hoi An. We weren’t disappointed once again plenty of vegetarian options - delicious food, great atmosphere, attentive and courteous staff. A wonderful night out thank you. 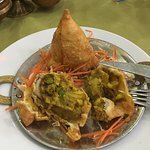 Been to Ganesh Indian Restaurant? Share your experiences!